How many times have you walked into a job interview and felt anxious, nervous or intimidated? I have found that most job seekers experience one or more of these feelings before and during almost every interview! I know that job interviews can be very intimidating, especially if you are not prepared. If you are willing to put in the extra work and use the job interview tips on this site, you will find that your next interview will be more comfortable than interviews you have had in the past. You have come to the right place for expert advice, strategies, and job interview tips that will help you pass your next interview. The job interview is simply a conversation between you and the employer. "Sell yourself" and convince the employer that you are the best candidate for the job. Tell the interviewer more about your knowledge, skills, and abilities. Learn more about the position, department, and company. Show the interviewer how you can make an effective contribution to the company. If a company calls you for an interview, they have already reviewed your resume and want to hire you. At the interview, your job is to prove to them that they want to hire you. This is your chance to "seal the deal." Interview preparation is key to a successful job interview. The lack of preparation can ruin your chances of getting the job. One-on-one interview - One person interviews you. Panel interview - Two or more people interview you. Phone interview - One or more people interview you, over the phone. Regardless of the type of interview, the same job interview tips apply. The rule is to approach every interview professionally, and with genuine interest. Always prepare in advance, and ask a trusted family member, friend, or associate to conduct a practice or mock interview with you for extra practice. A mock interview will boost your level of confidence and prepare you for the "real" interview. This practice will also help ease some of the nervousness that interviews typically generate. Recognize that you have competition. This job interview tip is of extreme importance. I encourage you to think of the interview as a competition. The interviewer will compare you to other candidates who have applied for the same job. To be successful, your interview must stand out from the others. If you provide vague answers, but other candidates provide thorough answers with an example for every question, you are likely to eliminate yourself from the process. I have learned that the majority of job seekers do not consider the competition. This is a huge mistake. Candidates have called or e-mailed me asking for feedback about why they were not selected for the job. My advice to a large number of them is to spend more time preparing for the interview. In so many cases, I know that someone else beat them out of the job during the interview process. Consider your competition and find a way to outshine them! 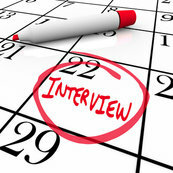 Preparing for the interview in advance will help you accomplish this. The job description tells you what is expected of you on the job. It outlines the required skills, responsibilities, and qualifications for the job. Once you know what is expected of you and what the employer is looking for in the person they select for the position, you can clearly tell the interviewer that you can meet their expectations. Determine how you plan to exceed the expectations, and express that in your answers. how you can fulfill each requirement. when and how you have performed the responsibilities successfully in the past. the skills and education that you have that match the requirements in the job description. To assist with this, write down a specific example from your experience that relates to each requirement. Study this information until you remember it. This will allow you to retrieve the information quickly while you are face-to-face with the interviewer. Yes, this may seem like a homework assignment, but this job interview tip will help you articulate your qualifications during the job interview as well as boost your confidence and subdue some of the nervousness. Clearly communicate your knowledge and abilities. Every position requires a certain degree of knowledge about a particular subject or career field. Some jobs even require knowledge and expertise in multiple areas. The job description tells you what these areas are. Discuss your relevant knowledge with the interviewer. Highlight specific experiences and accomplishments to paint a clear picture of what makes you qualified for the job. As you answer the questions, include specific examples from your experience in every answer. The interviewer wants to see that your abilities match the requirements in the job description. Your answers should relate directly to these abilities. Articulate what you will do to fulfill the responsibilities of the job. At the end of the interview. Ask the questions that you have prepared. Also, ask about the next steps in the hiring process. What is the time frame in which they will select someone for the job? What is the start date of the position? When will someone contact you? Get contact information for all interviewers (full name, title, mailing address, phone number). You will need this to send a thank you letter. If they do not contact you within the specified time frame, you may call them to check on the status of your interview. Always send a thank you letter. Send it the same day via mail. Use standard letter format with a matching envelope. Send a separate letter to every interviewer, if there are more than one. Never complain or say anything negative about your former employer or boss. Do not discuss personal information such as age, race, nationality, marital status, and personal interests. Do not ask about salary during the job interview. You don't want the interviewer to think that you want the job just to get a paycheck. It is safe to discuss compensation after you receive the job offer, or if the interviewer brings it up first. Do not lie or stretch the truth. Stretching the truth is the same thing as lying, and it will catch up with you sooner or later. The risk is not worth it. An employer will appreciate your honesty.